Intense Coincentration is a minigame in the game Super Mario 64 DS. It is one of Wario's minigames. 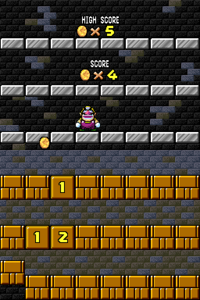 In this game Wario hits a Moneybags into the sky. The Moneybags then falls to the ground and drops some Coins; however it drops fewer coins than in Coincentration (there are 16 instead of 40). All of the coins will then fall to the lower floor where multiple Brick Blocks are. The coins will fall into different Brick Blocks. Then the player must touch the blocks that coins fell into with the Stylus. If a block without coins in it is touched, the game will end and any coins the player found up to that point are added up and become the player's score. A Rabbit, once caught from the castle by Wario, unlocks this minigame. There aren't as many falling coins this time around, but that won't stop Wario. Watch the coins carefully! This page was last edited on April 3, 2019, at 08:54.